After return from my holiday (spent with family at Modrava) on the last weekend in October, I was willing to try another attempt for the presence of the mist at the one of most beautiful place in middle Bohemia – viewpoint Máj. I proposed this occasion to people who attended Dolomity expedition, there was optimistic forecast with the high probability of local mist, so the chance for making wonderful shots was also high.We have joined together on the early morning and after that we hit the road to the viewpoint. 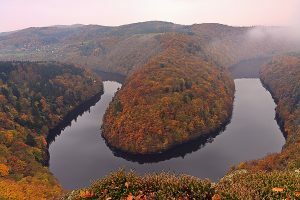 The viewpoint is simple accessible from small village with funny name Teletín (cca 50 km from Prague). It is a funny name for this village because if you want to reach viewpoint you have to go around or across grassland full of curious beefs. So much curious so they don’t hesitate to ran pretty quickly across the grassland if they see you stepping into their kingdom :o) This morning we saw small mist during the trip over the road, so the situation looks hopefully. We puddle in the mud and water before we reached the final forest way. We arrived to the place before sunrise time, however the fortune was not on our side. There was only small misty area at the right of scenery and even if sometimes it looks to come to us, it simply did not happen. This year I visited this place fourth times and without desired effect. But I will not give up and sometimes in the future the fortune will probable smile to me. However, the scenery is beautiful for photographers even if mist is not present. 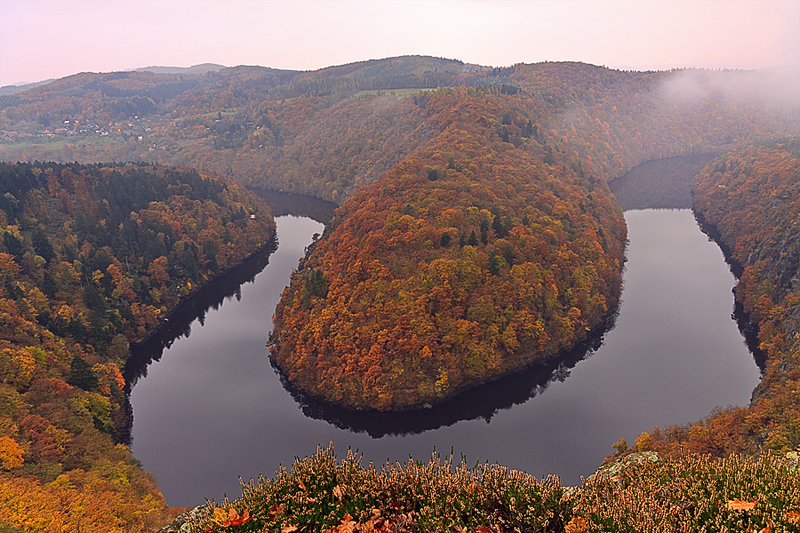 The meandr of Vltava river creates wild canyon which was at this time full of trees coloured in the orange and yellow tones. Moreover, there is at least five different viewpoints, each of them offers to visitors unique eyeview from different angle or perspective. This place can not disappoint you.